I love gaming, but I also hate sitting up straight in chairs when I don’t absolutely have to. You’d think a console would be the solution, but really, this dumb-looking keyboard-mouse combo from Razer is the missing link. 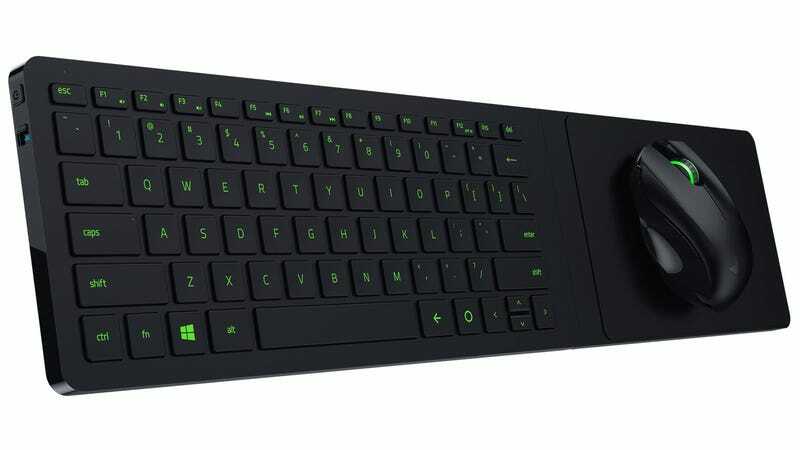 The aggresively-named Razer Turret is simple: it’s a wireless keyboard and mouse, but the keyboard has a fold-out mousepad so you can use it on your lap. It’s the only good solution I’ve ever seen for playing PC games on your couch, other than a three-foot sheet of plywood and a giant mousemat. Yes, I’ve tried that. The other, arguably more practical use, is as a remote control for a home media PC. Instead of paying for cable, I have a tiny desktop plugged into the back of my TV. It’s a perfect solution—instant Netflix and Spotify, with far less hassle than a smart TV—apart from needing a full keyboard and mouse to control. Last year, I bought this Logitech keyboard with an in-built trackpad, which was supposed to fix all my problems. Unfortunately, the trackpad is reminiscent of a Windows laptop that’s seen one too many coffee spills, and I’m endlessly frustrated when trying to do something as simple as make a video full-screen. There are problems with Razer’s solution: it costs $160, which is a truly great amount of money to pay for a glorified remote control (and a fair amount more than the Logitech). You’ll also have to hide it when other people come over, because it only really belongs in a 14-year-old’s bedroom. But if you can stomach all that, I suspect this will make the ultimate couch PC controller. Razer has a habit of making fantastic peripherals for PCs, and the attention to detail here makes me think the trend is continuing. The Turret can use Bluetooth, or a USB wireless dongle, it has Android-specific buttons for use with a Google TV, and a sleek-looking docking station. As long as the mouse is accurate and the keys suitably clicky, I might have just found a new way to never sit up.